John awakes from a nightmare. I'm sorry, the whole picture is actually coloured, but digital the coloures looked ugly; so I show this in greytones. This is so cute! 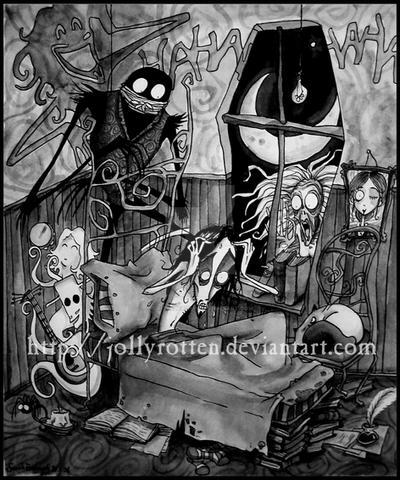 It's got such a Tim Burton feel to it, I love it! 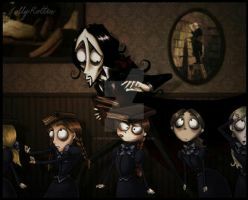 Dis has Tim Burton written all over it. 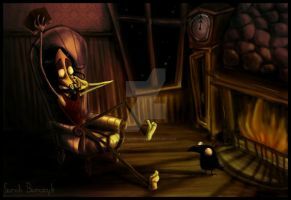 Love the art style, reminds me of Tim burton! Where's Jack Skellington in this picture? Because I don't see a Jack Skellington that should be here. Reminds me of Tim Burton. 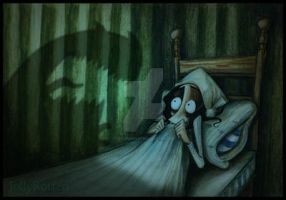 This is creepy because that looks exactly like my room and where I put my bed. And the window is in the right place too. But it's still awesome. Amazing. 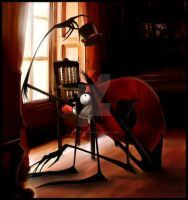 Reminds me so much of Tim Burton´s short film "Vincent"
That's creepy. I like it. wew!!! i like it alot!!! My god this is amaaaaaaazing ! 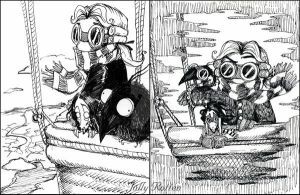 It really looks like Tim Burton's style ! (your attention ?) Excellent work ! So know how he feels. one of the narlyest pictures i have ever seen. rock on. this is a really good picture! Please the article and support your fellow deviants by checking out their work! Congrats! love it! it's kinda like tim burtion!! awesome! HAHAHAHA! reminds me of waking up after a hangover. by the way, did you use charcoal in this one? poor guy, i know how he feels, nice job, sir! excellent imagination! No, I used watercolours, but I didn't like how it turned out, so I adjusted it with greyscale on the computer. it looks awesome, man. really! great job! THIS IS AMAZING!!! i LOVE IT! INSTANT FAV.! I love the laughing shadow ^^ And pretty much everything else,it's all really good! This is really cool. And kind of disturbing. But still cool. you're fantastic. one of my favorite deviantartists i've come across.